What is George Osborne playing at? On a day when previously supporting economists urged George Osborne to change tack (1) we learnt that many billions are being put aside, doing nothing in an economy with 0.7% negative GDP growth! As explained in ‘Simon says: QE is the biggest confidence trick of all time.’ (2) Quantitative Easing has the unspoken-about capacity to eliminate government debt. So far, it has in effect reduced the debt burden down to about 45% of GDP (3). Alternatively, those gilts could be monetised (turned into money) and spent on stimulating the economy. In spite of being asked, by Paul Mason of the BBC and others about this possibility, Mervyn King did not acknowledged that this is a reality (4). But then he did not deny it either! Not only are we not being told this but it gets worse! … we have a situation where over a third of the outstanding National debt is sitting in the Government owned Bank and another section of the Government, the Debt Management Office – an arm of HMT – is paying interest to the Bank which is again just sitting there unused. As you teach any child it is good to save for a rainy day. The UK Chancellor of the Exchequer appears to have taken that advice to heart and has a nice fat piggy bank set aside. The question is: how much more rainy does it have to get before he spends it? That is right! £31 billion that Government has spent on interest for Government gilts which the Government has bought back from banks, pension funds and other institutional investors. Now, in the ‘real world’, if you buy back or pay off an IOU, you assume that you have cancelled that debt. You don’t put the IOU into a special drawer marked ‘money that I owe myself’ and pay interest, on that ‘money that I owe myself’, into an account that you have opened for yourself to hold that interest. It is nonsensical! So what does this ‘nonsense’ suggest? The scandal is that the free (tory) press also know this. While it is possible that it may generate a lot of vote-buying for the election, it may also be used to enrich the rich further. My thoughts entirely: all there to try to buy the next election. Its been a successful strategy in the past. At the next PMQ (which is some way, away, I know) Miliband needs to make this the first subject that he questions Cameron about. 1. 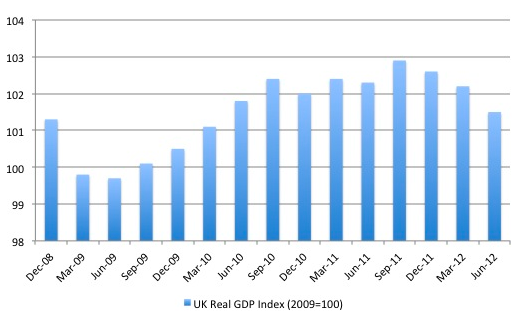 Real GDP “decreased by 0.7 per cent in Q2 2012 compared with Q1 2012″. 2. “Output of the production industries decreased by 1.3 per cent in Q2 2012 compared with Q1 2012, following a decrease of 0.5 per cent between Q4 2011 and Q1 2012″. 3. “Construction sector output decreased by 5.2 per cent in Q2 2012 compared with Q1 2012, following a decrease of 4.9 per cent between Q4 2011 and Q1 2012″. 4. “Output of the service industries decreased by 0.1 per cent in Q2 2012 compared with Q1 2012, following an increase of 0.2 per cent between Q4 2011 and Q1 2012″. So production and construction have now contracted for two consecutive quarters and are thus unambiguously in recession. And now the service sector, which had resisted the broadening gloom until now, is also in decline. What an appalling indictment of government policy. Given the original reserve crediting didn’t cause the money supply to widen this is just treasonous and insane. The resale obviously can’t be inflationary – the money creation bit from part one happens over 5 years before the reissue of gilts. Re-issue will obviously be deflationary as banks will allocate liquidity to buy the gilts instead of using the money for something else. But it cannot be inflationary as there is no money creation at that point. The second part of QE should be abandoned. A sensible government would announce that the money supply is shrinking, that the £325 billion in the Asset Purchase Facility can be safely monetized and that public sector cuts are cancelled and a £175 billion stimulus package can safely be afforded. How likely is this? Given how corrupt, incompetent and misleading [it] is [of] the current government to mis-explain how the economy works in order to justify selling off the public sector to their friends and funders. The Tories and their backers want high unemployment and household debts to rise as this lowers wage demands and increases corporate profits. They are deliberately engineering a slump in order that the banks who provide 50% of their funding and the donors who can afford the £250,000 dinners with Cameron can slightly increase their profits. Business is sitting on £700 billion of retained profits, banks are rich enough to pay an average of £350,000 to their staff. So what does Cameron do? He abolishes the bankers’ bonus tax, drops the 50p highest tax rate, lowers corporation tax and exempt overseas subsidiaries of multinationals from paying tax. It seems that the only conclusion that can be drawn, is that George Osborne et al are deliberately misleading the electorate and deliberately wrecking the economy in order to justify lowering wages, lowering benefits, increasing unemployment, increasing household debt, running-down the NHS/state education and dismantling public services. Furthermore, there is a little nest-egg of £31 billion ready to be pulled out as a sweetener for the 2015 General Election. I don’t think the banks will lend in to the real economy because they calculate that such a socially useful strategy gives low returns to them. Should they ‘defect’ from this generous strategy and chose instead the selfish strategy of ‘hoard and wait’ then they could make not just a large return but an epic one. They could emerge as owners of everything people will need in order to rebuild their lives. Water, power, rail, hospitals, you name it. This is what the banks are waiting for. And our politicians are giving them our money so they can. It is probably a great mistake to think that George Osborne, or at least those advising him, do not know what they are doing. What George Osborne might gain as a result of taking the flak for being the ‘worst Chancellor’ of all times is a matter for speculation. Paul Mason and Jeremy Werner asking Mervyn King yesterday about monetizing the debts in the Asset Purchase Facility. King does not deny the monetization. It is time somebody FOI-ed the Bank to ask for full break down of the maturity dates of all the gilts in the APF. The shortest we know is 3 years and this was bought 2009 so some of the gilts will start to monetize … about now. There is no prospect of selling the gilts back put into the private sector until 2017 at the earliest (OBR projection is … the government to have large deficit spending requirements until at least then). Come on guardian- read some MMT and then ask the right questions. Do not let the establishment get away with an utterly fraudulent description of the economy.